Gosh, I can't believe it's been so long since I posted. I've been busy with work stuff and a couple of creative endeavors to make some money. When I arrived at Mom's place this afternoon, I found out that she was just leaving to go on a trip to see a large Christmas display in the area. A local company, Quick Response Restoration, has been growing its festivities each year. It's a good outing for the elderly and Mom was one of about 10 that was going. She left almost as soon as I got there and I thought she was going to cry. I told her and the rest to have a good time, and Mom turned and said, "But I want to stay with you!" I felt bad. She won't remember the trip. Then again, she wouldn't have remembered me being there either, so it's better she get out from being cooped up. If I had only known, I'd have saved myself an hour's drive. 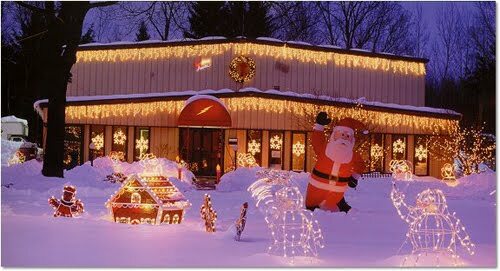 Aww - I used to take my mom for evening drives in December to look at light displays. She loved them. One night it was really cold out but otherwise fine (i.e. good road conditions) so I decided that we'd go out. I went out to start the car to warm it for mom and thought I'd cleverly lock the doors (we have a lot of car thefts in our city when you leave your car running to warm up). I have two sets of keys, so no problem, right? Nope. The second set of keys doesn't work when one set is in the ignition. DOH!! You should have gotten on the bus with her and enjoyed the lights too. I thought of going but it wasn't a big bus. It was a car (room for 3) where my Mom rode, and a minivan (room for 5) and that was full, too. I give the activities directors credit. It would be a big undertaking to watch over 8 people. They were going to stop at McDonald's for dinner and I can't imagine coordinating only THAT considering that most of the residents on the field trip had walkers and dementia!